The following review appeared in the Journal of American Physicians and Surgeons (pdf). Jane Orient is the lead doc at Association of American Physicians and Surgeons, publishers of the journal. 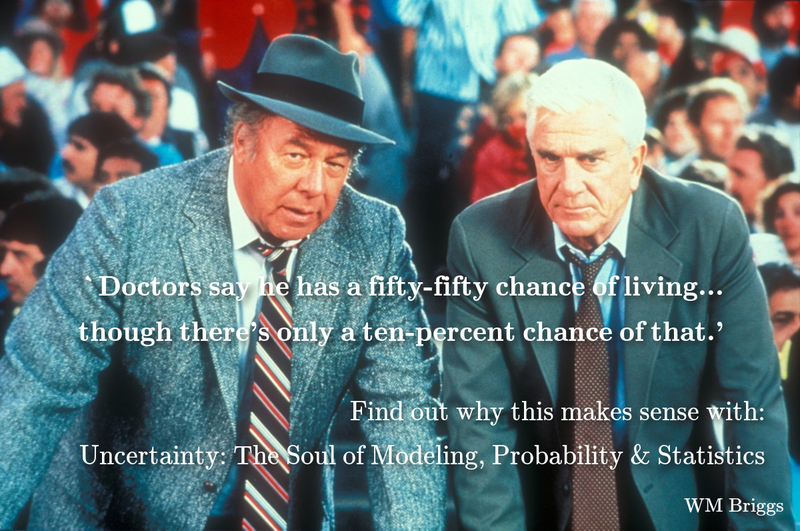 Uncertainty: The Soul of Modeling, Probability & Statistics, by William Briggs, hardcover, 258 pp, $59.75, ISBN 978-3-319-39759-9, Springer International Publishing Switzerland, 2016. Yes, this book is about probability and statistics, and there is some mathematics in it, but fundamentally it is a book of philosophy. If you follow his blog, wmbriggs.com, you will recognize that he is a devotee of Thomas Aquinas. Some of the book’s key insights are: Probability is always conditional. Chance never causes anything. Randomness is not a thing. Random, to us and to science, means unknown cause. One fallacy that Briggs chooses for special mention, because it is so common and so harmful, is the epidemiologist fallacy. He prefers his neologism to the more well-known “ecological fallacy” because without this fallacy, “most epidemiologists, especially those employed by the government, would be out of a job.” It is also richer than the ecological fallacy because it occurs whenever an epidemiologist says “X causes Y” but never measures X. Causality is inferred from “wee p-values.” One especially egregious example is the assertion that small particulates in the air (PM 2.5s) cause excess mortality. Quantifying the unquantifiable, which is the basis of so much sociological research, creates a “devastation to sound argument…[that] cannot be quantified.” Briggs deconstructs famous examples and the “instruments” they use. Briggs will not be well loved by those who write “evidence-based” papers replete with parameters, regressions, and p-values. Those who study Briggs will no longer be overawed by such papers, however prestigious the journal that publishes them. But he validates the importance of first-hand observation, insight, and intuition. To my mind, he shows that the need for the art of medicine is proven by the science. Despite its heavy subject matter, the book is full of humor and a delight to read and re-read. …and so it does have the power to turn evidence based medicine on it’s head as Dr Jane Orient says. I second that. I hope it does and I hope Briggs will be fully credited in the fullness of time. feeding frenzy of trial lawyers. Does ANYBODY really not recognize that detail about randomness???? Sure, many people do discuss “random” (and variations of that word) as if it were a thing or some vague force, but that’s metaphorical verbal shorthand…not actual literal belief per the literal meaning of the words…. Say what??? There’s ample studies ‘out there’ where the disease mechanisms arising from tiny particulate ingestion ARE researched, with many being understood. Here’s one such from close to a decade ago: http://www.ncbi.nlm.nih.gov/pubmed/19034792 . That & others like it are cases in which correlations were/are observed — were those correlations have prompted and continue to prompt ongoing research into identifying [and treating] the various causal factors & disease mechanisms that account for the correlations observed. Follow the links therein to the full text of the criticism. You should avoid linking abstracts. They are often more sales hype than summary. The one you linked appears to be a meta analysis (IOW a summary of other research). The abstract doesn’t mention it is itself a study. Air pollution has been considered a hazard to human health. In the past decades, many studies highlighted the role of ambient airborne particulate matter (PM) as an important environmental pollutant for many different cardiopulmonary diseases and lung cancer. Numerous epidemiological studies in the past 30 years found a strong exposure-response relationship between PM for short-term effects (premature mortality, hospital admissions) and long-term or cumulative health effects (morbidity, lung cancer, cardiovascular and cardiopulmonary diseases, etc). “strong relationship” is not necessarily a causal relationship. There is a strong relationship between the price of rum and New England preacher salaries. In nearly all papers in epidemiology the only thing done was to measure (via the Hypotheses Test) the correlation between two variables. All the Hypothesis Test can do is rule out suppositions of causation since correlation is a requirement for causation. Unfortunately, correlation between any two variables in a given data set is likely. Note the leap in the abstract from: Numerous epidemiological studies found strong exposure-response relationship to Air pollution has been considered a hazard to human health Why? Because there is a “strong correlation” — whatever “strong” means (0.1%? 2% 90%?) Likely, quite small though. There is a strong correlation between having a fast moving lead projectile colliding with one’s head and death (quite high). You don’t see studies of this hypothesis — probably because of the size of the correlation. When it’s small one must resort to statistics. Somewhere along the line this has been forgotten and we get things like “X is good for you” and “X is bad for you” and not “X Might be good or bad”. The word “might” has vanished from many press releases. Strangely, the EPA actually tried to verify all these “strong correlations” with actual experimentation. Strange because pollution is trotted about a “known” health hazard! Thanks, DAV. Now on to ‘random’, and again, Ken: Matt has written extensively on this blog; perhaps you should better inform yourself (like, e.g., by searching Matt’s site) before you weigh in on topics like PM 2.5s, and ‘random’. It’s true that the old (and not yet deceased) frequentist view of probability requires chance (or Chance) to be real; probability is (somehow) created in the wake of Chance. Chance is the being, to a frequentist, which fiddles with the coin as it is spinning, causing it to land heads. Busy man, Chance. Think of all those quarks it has to spin. And people sure seem to ACT as if ‘random’ were a cause; they certainly use statistics, and interpret statistical results as if ‘random’ were a cause; for example, people notoriously ACT as if ‘randomizing’ two groups was far superior to “deliberately matching them on everything I can think of that could matter”; and they certainly don’t ACT as if ‘random’ were a shorthand way of saying “I don’t know”. Besides, how much more ‘shorthand’ can you get than “I don’t know”? Why not just say that, and ACT like THAT’S true, if that’s what scientific-type people really “believe”? Your argument that ‘random’ as Cause is just a ‘shorthand’ doesn’t even pass the logic test. JohnK, do you really believe the above statement and all other similar blacket claims in the book? And sit there smugly confident you’re absolutely correct. And you are, but you’re also omitting key facts — like studies that have identified the mechanisms between the correlates (causes & effects) really do matter. And there are tons of those (not literally “tons” but a lot). That’s only substantially true within Briggs’ mind (apparently) and some readers of his blog. Briggs has a continuing inclination to perceive metaphor & shorthand linguistic descriptions as literal* to the point of redefining the actual meaning into something else and then arguing why that something else is wrong. And sit there smugly confident you’re absolutely correct. And you are, but you’re also omitting key facts — like studies that have identified the mechanisms between the correlates (causes & effects) really do matter. Homework: why is the price of rum correlated to New England preacher salaries when on the surface they should be independent? What is the causal relationship? Some studies actually find causal relationships by data analysis alone? Possible but not easily accomplished (see Pearl on causality) and Pearl’s methods are definitely not SOP in epidemiology. Bet you can’t find one that does determine a causal relationship — not just claimed but actually demonstrated. The Jerritt study of PM2.5 certainly didn’t find a causal relationship only correlation and found a correlation only by using an unproven spatial proxy. The EPA ran a very recent experiment subjecting humans to exhaust fumes to do what exactly? If all of these pollution statistical studies are correct then the EPA subjected humans to known health hazards. Like testing if shooting people in the head is harmful using human test subjects. Why do this if the hazard is already known? Pure evil. OR …, the EPA doesn’t believe the studies after all and the studies are just candy to pass out to the statistically illiterate. I repeat finding a correlation doesn’t mean you have found a cause. It’s impossible to make this determination using only two variables and using three variables can only determine three causal relationship out of a possible twelve. And does so by examining the interrelationships between the variables and not just using them as regression terms. Briggs has pointed out time and time again that the Hypothesis Test is essentially a useless tool (finding correlations is all too easy). It’s the major source of these p-values. The p-value isn’t the correlation but a measure of how well the regression fits the current data. A p-value tells you zip about model performance. Using it is like claiming the auto you built will be a great performer because you used quality screws in its construction and — hey! Here are their quality test results! You instead need a model that predicts. Drawing a line in a current data set rarely is capable of prediction with any confidence or accuracy. If the model can’t predict it is a curiosity and not a useful tool. The Jerritt PM25 study and every last one of the ones referenced in the linked abstract (itself an abstract of other papers) were published only because a useless calculation had a particular value. No one ever bothered to determine if they can predict. And all of them are finding things hovering in and around the noise level. IOW: low impact. Egregious indeed. Bill, getting the book. As a knuckle dragging clinician with a second degree in clinical epidemiology, this needs to be shouted from the rooftops.